American Coalition for Filipino Veterans Inc.
My name is RODOLFO "Rudy" PANAGLIMA. I am Filipino World War II veteran. I am a member of American Coalition for Filipino Veterans. I am 86 years old. My wife and I are US Citizens. We reside in Arlington, Virginia. My wife PURA is 83. She and I immigrated to the United States more than 20 years ago. We have four adult children. My two sons in Philippines, ROLANDO and RAOUL, have approved immigration petitions since 1995 - and have waited more than twenty years to join us. We need Rolando and Raul to take care of us - because of our age. We don't have relatives in the area. Fortunately, my two other children, Olivia and Roel, happily live in England. In World War II, when I was 13 years old, my father, a guerrilla commander, drafted me as his runner or courier to smuggle vital intelligence, gather information and collect voluntary contributions from our town people. Later during the liberation campaign, my father and I were attached to US Airborne & 1st Cavalry Division. Today, I am a proud American who had served honorably. Hopefully in a few months, my two sons could be with me in America with this parole visa program. On behalf of the whole Panaglima family, I would like to convey our heartfelt gratitude to his excellency, President Barack Obama and to the honorable Senators MAZIE HIRONO, HARRY REID, TIM KAINE and others for their humanitarian leadership and for helping us elderly veterans. We hope President Obama's executive order for a humanitarian parole visas for the children of my comrades and their widows will be implemented quickly and fairly by the U S C I S.
Maraming salamat. Thank you very much. Yesterday, we were sad and upset about the Filipino Veterans Family Reunification (FVFR) as a part of the Comprehensive Immigration Reform bill, S. 1639, being blocked in a procedural battle on the Senate floor by a bipartisan vote of 53 to 46. Today, we can remain hopeful because of the previous overwhelming Senate May 24 vote of 87 to 9 for the Akaka FVFR amendment. Salamat po for your continued support and efforts for equity+family. Have a great July 4th holiday! Senate's failure to pass the comprehensive immigration reform bill last week. The bipartisan bill was debated on the floor for two weeks in an effort to accommodate several amendments toward a final Senate vote, but was closed for further discussion last Thursday, June 7, by Senate Majority Leader Harry Reid (Nevada), leaving the bill in limbo. "We share the disappointment of Senator Akaka, on whom we pin our hopes for the reunification of our family," the 81-year old veteran, who petitioned his three children and two underage grandchildren 15 years ago to be allowed to join him and his wife Luz in the U.S., added sadly. of the Philippines for the last two years of the effort that led to the capture of Japan's General Yamashita. 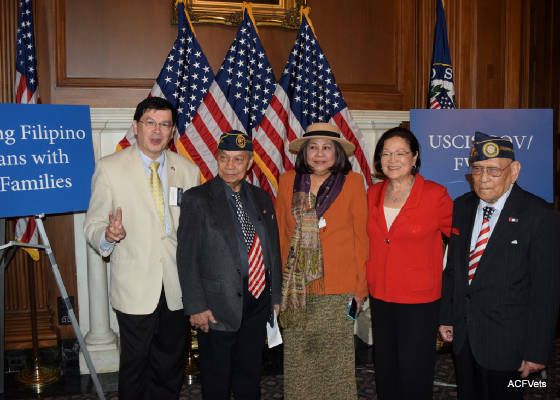 Akaka's bill, the Filipino WWII Veterans Family Reunification Act, had won an overwhelming 87-9 Senate vote as an amendment to the senate immigration bill on May 24, raising a chorus of jubilant Filipino American veterans whose children had been waiting in the immigration pipeline. According to estimates, there are about 18,000 eligible children and grandchildren to be affected by the bill. The bill, however, will cover only those family members for whom applications for emigration to the U.S. have been filed and paid for by naturalized Filipino WWII veterans. The reopening of the Senate debate on the immigration bill is expected to take place this week. Some veterans, including Caleda and his Hawaii-based compatriots, are also looking at other options. "We have met with Sen. Akaka's district office staff, in particular Michael Kitamura, and are looking at the suggestion of pushing the Akaka bill as part of the equity bill," Caleda said. "We are very happy about the good news," Joe Gonzalez, 82, of Texas, told PN by phone on May 24. "I petitioned my seven children 12 years ago in 1994, and paid the $90 fee for each of them. They are still waiting, and have started to contact me when they could come." A former president of a FilAm veterans association in Hawaii when he lived there for 11 years, Gonzalez was among the veterans who came to lobby for the Akaka bill for its successful inclusion in the senate immigration bill that eventually passed in the previous 109th Congress. Joaquin Tejada, 80, a D.C.-based veteran member of ACFV who lobbies in Congress as frequently as his bad legs could stand the walking, also hopes his two daughters could finally be reunited with him too. Celestino Almeda, 90, who lives in Virginia and still manages to take the Metro to Congress by himself despite one un-seeing eye, petitioned for his only son, Reynaldo, two years ago. "I am waiting for him to join me," he said, adding that he paid the current fee of $120 for his application. These veterans are among the remaining 7,000 Filipino veterans living in the U.S. after many of their naturalized compatriots had chosen to go back to the Philippines. Of the surviving 18,000 to 19,000 Filipino WWII veterans estimated by the Akaka bill, 13,000 are living in the Philippines. for Filipinos who served alongside U.S.
servicemembers during World War II." million proposed budget for Filipino veterans. 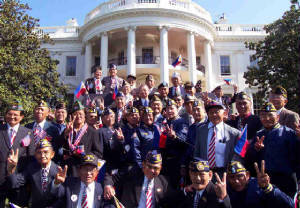 WASHINGTON, DC – On the 64th anniversary World War II, elderly Filipino veterans received early Christmas gifts from three Republican leaders who will champion their campaign to win full U.S. recognition and VA pensions next year. On December 16, 2005, Rep. Darrell ISSA (R-Vista CA) re-introduced the new "Filipino Veterans Equity Act of 2006," The original cosponsors of H.R. 4574 are: Bob Filner (D-Chula Vista CA), Duncan Hunter (R-El Cajon CA), Richard Pombo (R-Stockton CA), Del. Madeleine Bordallo (D-GUAM), Thelma Drake (R-Virginia Beach VA), Dan Burton (R-Indianapolis), Neil Abercrombie (D-Honolulu HI), Bobby Scott (D-Richmond VA), Michael Honda (D-Campbell CA), and Howard Berman (D-Van Nuys CA). 5 Republicans and 6 Democrats. Earlier on Capitol Hill, Issa was thanked by ACFV leaders: Pat Ganio, Fred Diaz and Jose Genito of Jersey City's PAVO. Organization, Regino Nacua of San Francisco Fil-Am Veterans, Spouses & Families Assn., Manuel Cannu and Dalmacio Chuga of San Diego, Alberto Bacani of Virginia, Joaquin Tejada and Tomas Culanag of DC and Percival Abu, Embassy veterans officer. Issa, a Vietnam War U.S. Army veteran and a businessman, told ACFV leaders, "I'm positive we can do the second part next year... We always keep our promises. However, we (congress) don't keep them on time." He is a member of the International Relations Committee. "We are quickly fading away. Schwarzenegger, Issa and Allen gave us Christmas gifts to fight on," said Alfredo Diaz, 89, New Jersey veteran coordinator of ACFV. Diaz is a former marathon runner, a defender in the Battle for Bataan and escaped from the Death March in 1942. ACFV also thanked Philippine Ambassador Del Rosario and Gen. Lorenzana of the Embassy's Office of Veterans Affairs and Rep. Filner for their behind the scenes efforts with Issa. The recent resignation of Rep. Randy "Duke" Cunningham (R-Escondido CA), former main sponsor of the Equity bill (H.R. 302), had placed the bill in limbo. The bill had to be re-introduced by another Republican as main sponsor to proceed in the legislative process. Issa also filed a separate House resolution H. Res. 622 to complement Senate Resolution S. Res. 307 introduced by Sen. George Allen (R-VA) that "recognizes and honors the Filipino World War II veterans for defense of American democracy" that earlier passed on November 10. Earlier, the veterans joined the forum of the Congressional Asian Pacific American Caucus chaired by Rep. Michael Honda (D- Campbell CA). They praised the legislators for their commitment to pass their bills in 2006. Ganio publicly thanked Vellie Dietrich-Hall, commissioner of the White House Initiative on Asian Pacific Americans. Dietrich-Hall, a daughter of a Filipino veteran, testified. At a Philippine Embassy reception, the ACFV leaders met with Cabinet Secretary Ricardo Saludo, of Philippine President Gloria Arroyo, and presented a copy of the U.S. Senate Resolution. Gen. Delfin Lorenzana (ret. ), Arroyo’s special representative, Armando Heredia, executive director of the Natl. Fed. of Fil. Am. Associations (NaFFAA) and Dr. Sonny Carlota MD of Tennessee joined them. At a December 15 party at the VA headquarters, Bacani met with VA Secretary Jim Nicholson and later delivered a copy of Schwarzenegger's letter. To win in 2006, we need you to recruit a friend ! We marked the 64th anniversary of Franklin D.
into the USAFFE by our July actions. to help negotiate with the governor. were joined by our Jersey City Phil. Am. Vets. to consider for the October 1, 2006 fiscal year. cosponsorship of S. 146. NO commitments for now. wreathlaying photo opportunity at the Franklin D.
until they get what they deserve," she said. both are apparently running for president in 2008. September left this year to get cosponsorships. and the launching of the "Balik-USA Beterano"
Security Income ($560 to $700 monthly). successful July actions in our nation's capital. their younger comrades in Florida. bills S. 146 and H.R. 302 in Congress. annual budget of $22 Million. the Disabled American Veterans join their efforts. The council unanimously passed their resolution. of $22 Million that would fully restore the U.S.
provide them with honorable VA pensions." Post 509 now led by Dr. Crispin Echieverri MD. $22 Million budget for S. 146 and H.R. 302. Mayor of City of Milan, MI. Gandionco USN (ret. ), we met for an hour with Col.
National Cemetery to honor our fallen heroes. 1. Meet your Governor's staff for a Bush letter. 2 .Visit Senators' & Reps' local offices. 3. Join Fil-Am events & gather petitions. 4 .Attend July 24-25 Leaders Summit in DC. Action Days news coverage & the "Free Cabanatuan"
A $25 donation will be appreciated. WASHINGTON, DC - On the first day of the new 109th Congress, Representative Juanita Millender-McDonald, a Democrat from Torrance California, reintroduced the "Filipino Veterans Fairness Act," a bill that would provide Filipino World War II veterans with monthly disability pensions in United States and in the Philippines as well as educational and employment benefits for their dependents. Millender-McDonald re-filed her bill as House Resolution H.R. 170 on January 4, 2005. It was a result of her previous years’ meetings with the leaders of the 35,000 Filipinos in her district and with Philippine Government officials. Recently on November 22, 2004, the congresswoman met with Philippine President Gloria Macapagal-Arroyo in Los Angeles after the Bush-Arroyo talks in Santiago, Chile. They discussed the veterans’ issue and other items. Millender-McDonald is also a key leader of the Philippine-US Friendship Caucus in Congress. In June 2003, she met with the Philippine Government delegation headed by the House of Representative VA committee chairman Rep. Tomas Dumpit and Ambassador Del Rosario. “We welcome the reintroduction of the Millender-McDonald bill and the other bills that are expected to re-filed by Reps Cunningham and Filner in the House as well as Senator Inouye in the Senate,” said Patrick Ganio, 83, the president of the American Coalition for Filipino Veterans, Inc. (ACFV), a Washington DC-based advocacy group of 4,000 members. “We hope these bills will be the catalysts to a new law that restores the U.S. veterans status and provides equitable VA benefits to our living heroes,” Ganio added, a defender in the Battles in Bataan and Corregidor and a former POW. The “Fairness bill” was originally filed on May 6, 2003 and provides veteran benefits to the Filipino veterans who fought side by side with American soldiers during World War II. In addition to providing desperately needed monthly disability benefits, the bill calls for home loan assistance for U.S. based veterans, educational assistance for their U.S. and Philippine-based dependents, and employment services for U.S. based veterans and spouses, as well as health care at the Manila VA Outpatient Clinic. The bill's key provision provides a VA disability pension "notwithstanding any other provision of law... at rate of $100 per month" to an estimated 15,000 poor Philippine-based Filipino veterans. “With Capitol Hill leaders are now grappling to cut down the federal budget deficit - now at a half-TRILLION dollars and dealing with the Iraq War and Social Security, we can expect bitter partisan battles between the Republican majority and the Democrats. According to congressional staff, the legislative prospects of our Filipino veterans bills look very bleak this year, “ said Eric Lachica, ACFV executive director and a registered advocate in congress. “Realistically, a Filipino veterans bill can only pass if Bush can be persuaded to provide the budget line item for it in his Administration request to Congress in February or later,” Lachica emphasized. H.R.170 may cost at least $22 Million, he estimates. Arroyo and Philippine Ambassador Albert Del Rosario recently called upon the Filipino American community leaders to work as a “team” to pass veterans legislation as a “high priority.” Arroyo last November appointed retired Maj. General Delfin Lorenzana to be her special presidential representative on veterans affairs in Washington. Earlier on January 22, 2004, Arroyo made a written request to President Bush for a $22 Million budget for Filipino veterans pensions. The ambassador and Lorenzana are scheduled to meet next week with Filipino American Bush supporters during the presidential inaugural activities in Washington. WASHINGTON DC - (May 19, 2003) -- The White House invited two leaders of the American Coalition for Filipino Veterans (ACFV) to attend the State Dinner honoring Philippine President Gloria Macapagal-Arroyo on Monday, May 19. ACFV president Patrick Ganio, Sr., an 82-year-old veteran who fought in the battles of Bataan and Corregidor in 1942 and a Purple Heart recipient, was recently called by the White House Office of Social Secretary and informed of the invitation. Ganio was accompanied by Eric Lachica, the Washington DC based group's executive director, a son of a WWII veteran and a long-time community organizer. President George W. Bush and First Lady Laura Bush hosted the formal black tie and Philippine dress dinner in their residence from 7 PM to 10:45 PM for Mrs. Arroyo, her husband Jose Miguel Arroyo and 14 members of her official delegation. "We are deeply honored by the President and the First Lady inviting us to this historic and prestigious gathering," said Ganio. "We will redouble our efforts in helping Mrs. Arroyo and President Bush pass legislation in the US Congress and Senate that will restore official recognition and provide equitable VA benefits to our surviving veterans in the Philippines and in America," he added. "We requested Mrs. Arroyo to specifically ask President Bush to support Senate bill S. 68 of our longtime champion and war hero, Senator Daniel Inouye," according to Eric Lachica of the advocacy organization with 4,000 members. If S. 68 is made into law, 29,350 (VA new estimate) surviving veterans of the Philippine Commonwealth Army, recognized guerrillas and New Philippine Scouts may receive medical care and disability pension benefits ($100 monthly in the Philippines) from the Department of Veteran Affairs. Lachica estimates the bill will cost less than $40 Million yearly. Inouye's bill was a result of previous years of negotiations between the Philippine government's Joint Executive-Legislative Delegation, ACFV leaders, and US sponsors, led by Sen. Inouye, former congressman Benjamin Gilman (R-NY) and Rep. Bob Filner (D-CA) on a proportional benefit formula to meet the needs of Philippine-based veterans who face lower costs of living. Their consensus is that S. 68 is a realistic and equitable proposal that would overcome budgetary and legislative obstacles. Veteran leaders from Hawaii, Los Angeles, San Diego, San Jose, San Francisco, Ohio, New York Jersey City, Philadelphia and other cities attended Sunday's 6:00 PM Filipino American community Arroyo dinner at the Capital Hilton, and witnessed the Monday's 8:00 AM arrival welcome ceremonies for Arroyo by Bush at the White House south lawn, and to lobbied on Capitol Hill. Actions speak louder. Join us!